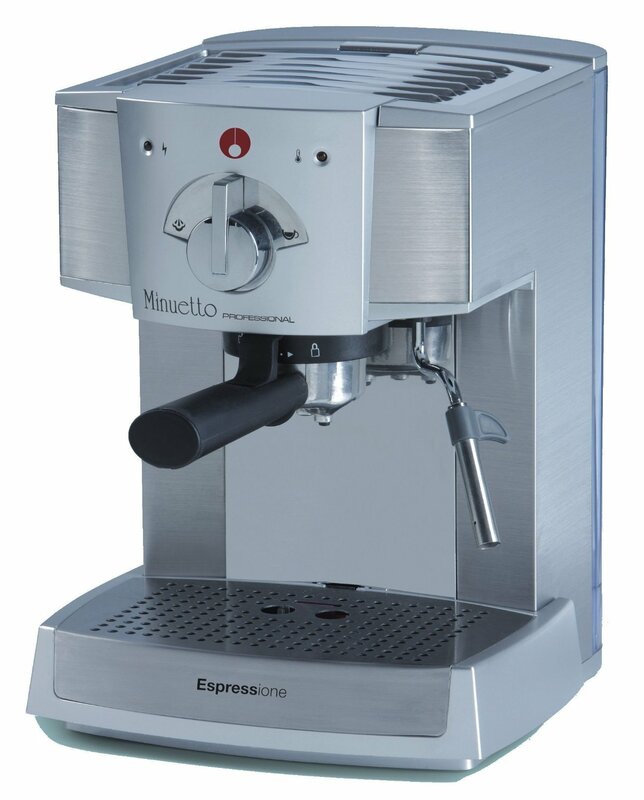 Espressione has a reputation of developing espresso machines and coffee makers that are of quality, consistent and simple to use. Three industry veterans with a combined experience of over 50 years, founded Espressione in November 2000 with the mission to create and market a collection of the finest coffee and coffee brewing products into all major world markets. The Espressione Café Minuetto Professional Thermoblock Espresso Machine reflects that passion of the Espressione brand of quality, consistency and simplicity. This stylish unit is extremely versatile as it brews espresso from both pods and ground coffee. It uses a 15 bar-pump method to push great flavours from the coffee beans into your espresso cup and produces steam almost in an instant due to its thermoblock heating steam. The coffee produced by the Espressione Café Minuetto Professional Thermoblock Espresso Machine is comparable to the ones you get at your coffee house while its Amxi-Cappuccino and Thermo Cream technologies gives you a quality cup of creamy and frothy cappuccino. There are a few safety features incorporated in this unit like the rubber grip handles, a self-priming temperature controlled boiler and high pressure safety valve. It comes with manual controls so you can adjust the temperature and pressure to create your customised espresso drinks. Use ground coffee and is also able to brew ESE espresso pods. Comes with built in frother. The steam wand is adjustable so you can steam or froth your milk in seconds to turn your espresso shots into lattes or cappuccinos. 15 bars thermoblock pump for fast and safe heating. 27 ounces with dual boiler heating system – a boiler for brewing and thermoblock system that produces steam. Located at the back of the unit, you can remove for easy filling and cleaning. Around 1 litre water tank means you can make espresso shots for your whole family. The tank is made from clear plastic so you do not need to guess when you have reached the fill line. Durable INOX housing/ABS plastic adding to its durability. 11.3 x 12 x 14.7 inches and weighs 14.2 pounds. There is a on-and-off indicator light. Comes with filter holder, 3 filters that accommodates ground coffee and ESE coffee serving pods, a measuring spoon which also tamps. Error control and overheat protection to ensure proper brewing and frothing. Thermo cream system and maxi-cappuccino device to optimise the temperature and frothing functions for smooth and creamy cappuccino. Self-priming so you do not need to set up much. Cup warmer at the top of the unit. 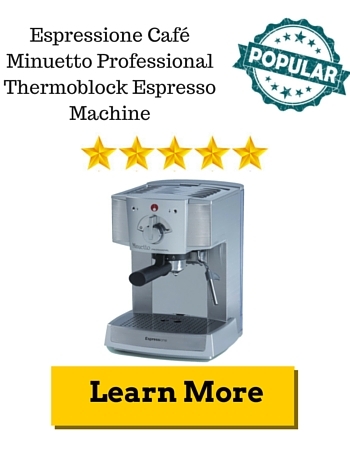 The Espressione Café Minuetto Professional Thermoblock Espresso Machine costs around $140 on Amazon with free shipping within US. Always Hungry in Texas said the Espressione Café Minuetto Professional Thermoblock Espresso Machine is little but serious and brew and fast and furious shot of espresso. You get a nice foamy topping on the espresso just like a quality coffee house. Michael David thinks this machine is worth your money and deserved her review. She has been a barrister for several years and she claims the Espressione Café Minuetto Professional Thermoblock Espresso Machine makes shot that are as good as the big expensive ones. Brews new and delicious gourmet coffee beverages easily and quickly. Stainless-steel esresso machine with a 15 pressure pump system. Brews gourmet quality espresso either using ground espresso or pods. The Espressione Café Minuetto Professional Thermoblock Espresso Machine has so many features and functions packed into its compact size. It is simple to use and produces a near perfect espresso. This coffee machine is a great option for coffee lovers and is a worthwhile investment for a professional espresso machine that is under $200. There are people who cannot function in the morning or even throughout the day without a hot cup of coffee. If you always buy it on your way to work, the costs will add up so it’s more practical to have your very own automatic espresso machine right in the comfort of your own home. It’s also convenient to have an espresso machine in your kitchen if you need a quick caffeine perk-me-up while going through your domestic chores. 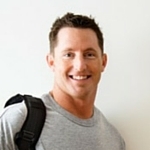 With so many brands, choosing the right one might be a daunting task. Alongside Astoria, there are some other awesome brands in espresso machines that vie for space on the shelves of espresso machine suppliers. These are Export and La Spatial brands. Both of them are well-known brands of espresso machines owing their mainstream accomplishment to their incredible quality, and their steady execution as well as life span. Export espresso Machine and La Spatial espresso Machine are viewed as the top brands in the premium classification of espresso making gear in Europe and the UK. What does the buyer look for when purchasing an espresso machine? An espresso machine is an imperative and vital appliance in a providing food unit as everybody needs some espresso with their dinners or in between. Henceforth ability to handle the high demand is one of the essential necessities of a decent espresso machine. The client needs a similar taste and fragrance at whatever point he purchases the espresso. There are different elements which are exceptionally vital and one recognize what elements to search for in a coffee espresso machine when it must be purchased for business application. It can befuddle on occasion as there are so many brands offering heaps of different machines with different limits and capacities. Different models of coffee espresso machines are classified by the ability to make espresso. They are ordered as gathering one, bunch two and gathering three machines which have one, a few taps that give steam and high temp water. The evaporator for the water additionally has a different limit and the entire plan can either be connected to a water line so that the kettle is naturally filled or it could be unattached to the water line and the heater must be physically filled. The espresso measurements can be set so that a correct volume of espresso is pumped out at whatever point the tap is opened. Finding the right coffee espresso machine in a business setup relies on upon the volume of business that you have or are hoping to have. Top of the line programmed coffee machines have propelled components, for example, electronic temperature direction, electronic temperature control for water and making of steam, well-being measures, for example, indoor regulators and so forth.